The good news is, golf is such a diverse game that there are a multitude of golf themed gifts you can buy for your loved ones, from golfing memorabilia to essential equipment. Perfect for helping to improve grip and swinging technique, as well as keeping hands warm in chilly weather, golf gloves are both practical and stylish and ideal for all-year-round play. For the young (or the young at heart), novelty golf balls can be a personal and fun-loving gift. Upload custom images or text to create your very own unique golf balls or choose from a wide range of novelty options online. Don’t get caught in the rain! With British weather being notoriously unpredictable, it’s important all golfers are prepared for wet weather – even in the summer! What’s great about waterproofs is that they’re handy away from the golf course too, so will get plenty of wear. A wide range of smart GPS watches are available to purchase online, so whether you’re tech-savvy or a total technophobe, you’ll find a watch that’s easy to use and game-enhancing. Smarten up your golf trolley with a vibrant and sophisticated pencil bag! Choose one that’s lightweight, waterproof and sturdy for easy and convenient use. Looking to get your kids into golf? Get them off to the best start with a set of junior golf clubs. Designed for smaller hands, these golf clubs will give your child the confidence to develop their golf skills, readying them for an adult club when the time comes. Perfect as a stocking filler, a scorecard wallet is an affordable and sophisticated golf gift that can be used by any golfer, no matter their experience level. There are a range of funky designs to choose from, or suave leather alternatives if you prefer. If you really want to go the extra mile with a golf gift this Christmas, splash out on a complete club set for men or women. Give your loved one the ultimate gift set, allowing them to practise their swing with multiple irons and advance their golfing skills. Golf flasks help golfers to stay hydrated and motivated on the course. Choose a coffee, water or hip flask for the golfer in your life and engrave it with a special message or name. 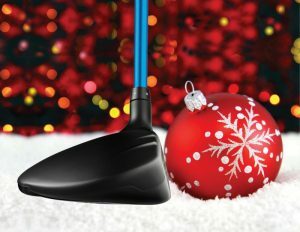 If the golfer in your life has everything they need to play the game, then why not gift them with an experience instead? At PlayMoreGolf you can purchase two types of vouchers. The first is the Experience Voucher, giving a lucky golfer up to 10 rounds of golf at their chosen locations. Alternatively, you can purchase the Membership Money-Off Voucher, which gives a golfer money off a PlayMoreGolf annual membership. To read more about these vouchers, you can read our dedicated blog post or purchase them here. If you’d like to learn more about flexible golf memberships, please click here to be redirected to our website.